An entirely new type of nanomaterial developed at Rensselaer Polytechnic Institute could enable the next generation of high-power rechargeable lithium (Li)-ion batteries for electric automobiles, as well as batteries for laptop computers, mobile phones, and other portable devices. 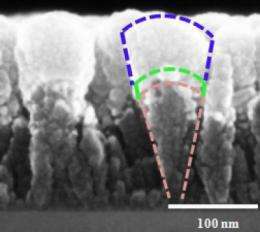 The new material, dubbed a "nanoscoop" because its shape resembles a cone with a scoop of ice cream on top, can withstand extremely high rates of charge and discharge that would cause conventional electrodes used in today's Li-ion batteries to rapidly deteriorate and fail. The nanoscoop's success lies in its unique material composition, structure, and size. The Rensselaer research team, led by Professor Nikhil Koratkar, demonstrated how a nanoscoop electrode could be charged and discharged at a rate 40 to 60 times faster than conventional battery anodes, while maintaining a comparable energy density. This stellar performance, which was achieved over 100 continuous charge/discharge cycles, has the team confident that their new technology holds significant potential for the design and realization of high-power, high-capacity Li-ion rechargeable batteries. "Charging my laptop or cell phone in a few minutes, rather than an hour, sounds pretty good to me," said Koratkar, a professor in the Department of Mechanical, Aerospace, and Nuclear Engineering at Rensselaer. 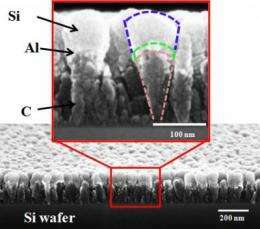 "By using our nanoscoops as the anode architecture for Li-ion rechargeable batteries, this is a very real prospect. Moreover, this technology could potentially be ramped up to suit the demanding needs of batteries for electric automobiles." Batteries for all-electric vehicles must deliver high power densities in addition to high energy densities, Koatkar said. These vehicles today use supercapacitors to perform power-intensive functions, such as starting the vehicle and rapid acceleration, in conjunction with conventional batteries that deliver high energy density for normal cruise driving and other operations. Koratkar said the invention of nanoscoops may enable these two separate systems to be combined into a single, more efficient battery unit. Results of the study were detailed in the paper "Functionally Strain-Graded Nanoscoops for High Power Li-Ion Battery Anodes," published Thursday by the journal Nano Letters. The anode structure of a Li-ion battery physically grows and shrinks as the battery charges or discharges. When charging, the addition of Li ions increases the volume of the anode, while discharging has the opposite effect. These volume changes result in a buildup of stress in the anode. Too great a stress that builds up too quickly, as in the case of a battery charging or discharging at high speeds, can cause the battery to fail prematurely. This is why most batteries in today's portable electronic devices like cell phones and laptops charge very slowly  the slow charge rate is intentional and designed to protect the battery from stress-induced damage. The Rensselaer team's nanoscoop, however, was engineered to withstand this buildup of stress. 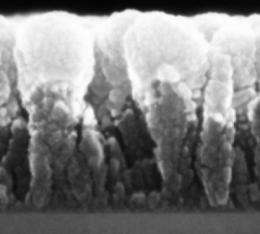 Made from a carbon (C) nanorod base topped with a thin layer of nanoscale aluminum (Al) and a "scoop" of nanoscale silicon (Si), the structures are flexible and able to quickly accept and discharge Li ions at extremely fast rates without sustaining significant damage. The segmented structure of the nanoscoop allows the strain to be gradually transferred from the C base to the Al layer, and finally to the Si scoop. This natural strain gradation provides for a less abrupt transition in stress across the material interfaces, leading to improved structural integrity of the electrode. The nanoscale size of the scoop is also vital since nanostructures are less prone to cracking than bulk materials, according to Koratkar. "Due to their nanoscale size, our nanoscoops can soak and release Li at high rates far more effectively than the macroscale anodes used in today's Li-ion batteries," he said. "This means our nanoscoop may be the solution to a critical problem facing auto companies and other battery manufacturers  how can you increase the power density of a battery while still keeping the energy density high?" A limitation of the nanoscoop architecture is the relatively low total mass of the electrode, Koratkar said. To solve this, the team's next steps are to try growing longer scoops with greater mass, or develop a method for stacking layers of nanoscoops on top of each other. Another possibility the team is exploring includes growing the nanoscoops on large flexible substrates that can be rolled or shaped to fit along the contours or chassis of the automobile. "comparable" reads "significantly smaller" to me. Otherwise they would have touted that the energy density is better or equal. The #1 problem in electric cars is capacity. If you can get enough capacity, you don't need to recharge that often, and you don't necessarily need to recharge as fast. If a full charge on your battery would equal driving 500 miles, the problem then is not how fast the battery can accept the charge, but where can you find a station that delivers enough power to charge it that fast. Your ordinary wall socket will give you roughly 1/1000th of that. You don't suddenly draw 1.5 MegaWatts of power from the grid without giving your local power co. a call ahead in time. How is this any different than Altair Nanotechnology's 5 year old nanosafe battery technology that is in commercial use and has demonstrated recharging of an auto in 10 minutes (by its customers)? Presumably the scoops could possibly be transferred over to the nanosafe batteries, or potentially other battery designs as well. Of course, the nanosafe's probably have their own molecular formation, but the concept seems solid. Basically we have the premise: Exact placement of the material, leads to high performance. As we get more knowledge of these different molecular formations, we will be able to design ever more powerful batteries in the future. Looking at the Electron-micrographs, this is brilliant. Congratulations to all of the researchers and techs at Rensselaer Polytechnic Institute. You have a winner. Then we should focus on smaller capacity with rapid charging. This way you can do mini charges while parked at work, the store, etc. Just have inductive charging parking spots. I think you misunderstood the point. The charging rate is relative to the size of the battery, so a large battery can be "mini-charged" rapidly while a small one can't be. A small battery is a lose-lose situation because you can't add miles to it very rapidly, and it won't get you very far anyhow. A 20 kWh battery can accept 40 kW of power and be charged in 30 minutes, giving you 80 miles. A 200 kWh battery can accept 400 kW of power and be charged in 30 minutes, giving you 800 miles. Or, alternatively, the larger battery can accept 80 miles worth of charge in 3 minutes, while the smaller one has to wait 30. The only problem is, where can you find a charging station that gives you that much power. And with the larger battery, 30 minutes every 800 miles is not a show-stopper. You might as well take an hour, or the whole night. You can plan ahead while you still have hundreds of miles left on the battery. Quick charging or battery swapping on the go is not a realistic option if you would have to do it so often that it becomes annoying and bothersome. Every other day you would have to wait in line to the charging station, waiting as every other EV owner on the street attempts to do the same, or find the parking spot that offers electricity so you can get home after work. In essence, we don't need faster batteries. We need batteries that hold more charge. Besides, the larger the capacity, the slower it wears out because the current draw is small in proportion. All is well, until you account for the fact that this battery system A) costs money B) wastes electricity. So it both increases the cost to drive, and makes the electric car pointless because it is now less efficient than the next alternative. Storage at charging stations might make sense for stations which service a few cars a day--but those would be unprofitable for other reasons. Doesn't matter how fast you recharge the individual cars, busy stations are going to use a huge chunk of power. Is this a problem? Not really. Upgrading the electric power infrastructure with lots of new (nuclear or renewable) power stations and a much better grid needs to happen with or without electric cars. With the battery sizes of today, an electric car would have to stop six times for that 500 miles anyways, so it would be rather difficult to move very large amounts of electric cars down the highway. The charging stations wouldn't be able to handle the volume of customers, because every electric car travelling down the highway would have to stop at every charging station along the way. You might as well erect a charging post every mile down the side of the road.